Reimagine your kitchen design as the aesthetic social hub of your home. Guests gather as you entertain or conduct business. It’s the center of your home; the communal epicenter of your private life. Not long ago, kitchens were hidden from guests. Tucked away behind walls and doors far away from dining rooms, residents masked the smell of food and hid the help that worked in the kitchen. Today, homeowners love to show off their “trophy” kitchens to their guests. In our modern day, is your kitchen a room that you share and show off to others? Does it accommodate groups of people while allowing you to fluidly prepare meals without pushing people aside? If not, you might consider a new kitchen design. Viridis Design Studio transforms desperate kitchens into bold conversation starters that inspire gathering and meaningful chit chat. While food is necessary to sustaining life, human interaction and sharing is vital to maintaining a healthy mind. Our seasoned kitchen designers and remodelling experts will craft a space that invites social gathering but also flows around your cooking and food preparation needs. Not only will a new kitchen design “wow” your guests and enhance your cooking enjoyment, but it will greatly improve the value of your home. Kitchen remodels give you more pachow for your penny. According to US News, “a minor kitchen remodel adds 82.7 percent of the project’s cost back to the home’s value.” That’s more than a bathroom remodel! Likely buyers think that a kitchen remodel costs a lot more than it actually does. So when they see your revamped clambake they’ll assume you spent a lot more than you actually did, and their perception of the value of your home will go up. Viridis Design Studio helps clients see the possibilities within their kitchen space – both large and small – then our remodeling experts help draft a design and execute the plan. Kitchen projects are complex. Materials need to fit the budget, measurements must be accurate, orders placed are double-checked for correctness, everything is installed by licensed and trustworthy professionals, and the project should come together in a timely manner. We are known for mixing natural elements with contemporary or modern lines and finishes. This style is called “Organic Chic”. The combination of materials relies on the beauty of natural elements such as the horizontal grain of wood, the veining of marble, sheet grass tile. With this design style as the foundation, we build in the homeowner’s personal style for a complete kitchen that is perfectly unique. Designated cooking areas, dining nooks, etc. A functional kitchen will utilize the home space in the best way whether you have a big house or a small condo. The room will be well-organized for cooking and maintaining clutter-free counter space. 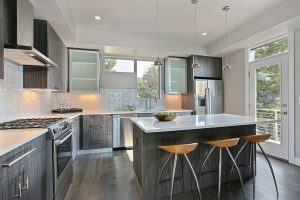 If you live in the Denver, CO, area and believe that your home could benefit from a kitchen remodel by Viridis Design Studio, contact us today. You can call us at (303) 489-9958 or fill out our online contact form. This transitional kitchen design blends elements from modern and traditional aesthetics. Beveled, white tiles meet crisp, quart countertops framed by full-overlay cabinets. Wood grain finishes bring a natural balance to glossy textures. If you are looking to create a kitchen that is modern, contemporary, or transitional in design, contact us for a consultation. We work directly with homeowners and contractors to construct a look that reflects the homeowners style or helps to get the top buying price from buyers. Call Viridis Design Studio today at (303) 489-9958 or fill out our online contact form.